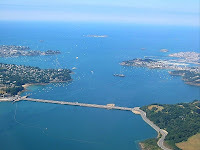 The tidal power station on the Rance Estuary between St. Malo and Dinard was the first of it's kind ever to be built. It was started in 1961. The turbines were renovated in 2002. It was pretty cold today so outdoor activities were not on the agenda. In the end we thought a quick jaunt to the tidal power station at the Barrage de la Rance might be interesting. The entrance was FREE ! and although the tour was very short the kids enjoyed it. There was a short film (headphones for English and German speakers) which explained the basic workings, development and the running of the tidal power station. After the film there was a small exhibition hall with interactive models showing the workings of the turbines which have been there for over 30 years now. The tidal power station can supply enough electricity for a town of up to 300,000 inhabitants. If you are crossing the Barrage at any time, try to take 30 minutes to stop and look around.